There have been many questions regarding this not-so-small house located along the Gulf Coast. I have brought it to paper. No one tells what happened so many years ago. It is as if they are hiding the truth for whatever reason. The Martin House is riveting and captivating. It is conceivable that the characters were on a mission to get to the bottom of all the secrets and lack of information that was shared. I spoke to many people that had first-hand encounters with the house and the entities that protected it. The mist that came from the bay was described as being a type of camouflage for the ghostly beings that lingered to resolve whatever unfinished business that they left behind with the living. When information is secretly being withheld from the public, it forces the imagination to take over. After researching what little records I could my imagination took control. I hope it is all that has been longed for. I myself wrote the book and for that reason alone (no information available) I created a story that was compiled of the interviews and information I acquired. It is definitely fiction but it is due to the fact that no information is available. I mean who built the house? Who lived there? It surely wasn't built just for company functions. And the biggest question is why wouldn't they let me rent it for my book signing and then rent it the next week for a wedding? When there is a secret or hidden agenda regarding something considered to be an icon within the community of course people are going to talk. I believe something happened. What exactly is the question. How can so many people be wrong? One being my mother and grandparents. Too much to be a coincident. I hope when it is re-released in December to bring more attention to it and get the story out. Sandy Creek is the Prequel but a story in itself. Too many things being hidden. Thank you for your interest and the comment to bring up something I myself have asked but looked partial on my books behalf. Comments from people on a YouTube video who have lived here their entire lives or work around it: I work at the mill. This house is not haunted. No murders were ever committed here and no family named Martin ever lived there. It was originally the home for the manager of the saw mill. When the paper mill was built they bought the home to use for company functions. I have been there many times and it is rather uneventful. The Martin name is not because of a family. It is named that because of Martin Lake. It is currently being remodeled by RockTenn. The only thing that creeps there is an occasion rat. This morning when I drove by I noticed there are plenty of private property signs. As an employee I can't even go there without permission. No hauntingly there just boring meetings. You guys can all grow up now and stop spreading fiction to everyone. This is the history I've known and I'm very sure I have quite a few years on all of you. Just because you make up things about your family and what was there doesn't make it true. You guys are perhaps some of the most ignorant people, you'll just believe what people say because they say it. First of all these comments are all opinions. No one is being ignorant except perhaps the one calling others names. Each of the comments are personal and only describe their experiences or stories they have heard. Some of the family members are deceased any you sir are a total disrespectful person for saying the things you have about those family members. No harm no foul is a rule to live by. Its great that you "have quite a few years" on some of these people but I doubt you are over 69. I am. And to tell them to stop spreading fiction? This is still a free country and they have a right to free speech. I mean unless that too has changed. There is nothing being said that is derogatory about the mill or its people and that is what counts. Now, If you can prove that these things DIDN'T happen that would be great and please feel free, but for you to call them ignorant, that is a sign of disrespect. They are simply having a conversation amongst themselves and sharing "rumors" or "stories" they have heard and the last time I checked that was their god given right. - Good day sir! Check out the Martin House through Google Earth, the yard and see for yourself. There is a child wearing an outfit that looks like the Morton Salt and she's walking a small white dog. Over to the left, you will see a woman in a long green dress, red hair put up, and a man in the yard who appears to be on ( I thought it was a riding mower at first) something that I can't figure but he sitting down on some kind of contraption. Google Earth. Satellite pics. I grew up in Millville where I was born and raised as was my father and his father before him. My father worked at the mill as his father before him and trust me because my father nor my grandfather didn't lie or make up ghost stories. I have been told by them the story of what happened and have relayed it to my children in my diaries for them to pass on. It IS haunted no doubt for I have been there on many occasions and the feelings u get are unexplainable. http://www.panamacityliving.com/rocktenn-family-fun-day-historic-martin-house/#prettyPhoto. This site has photos of people in the home. Looks very nice not sure if any are from upstairs. Also looks like an old drawing of the home in the photos. From what it says looks like they renovated it so maybe that's why no one was allowed in but only still allowed events outside? My Apologies to the writer Trina Ward, as my original comments about the house had nothing to do with her writing ability or calling into question her honesty. I truly wish her success in her work. Many people do think the house is haunted, probably many she interviewed believe so. The intent of my response was simply to shed truth to the reality of what I know of the place, which is to say, my knowledge is extensive. I have been in the house countless times at all hours day and night, from the grounds to the first floor, the second floor and the attic and can simply tell you that there is nothing "unnatural" about the place. It is merely an old house, used for meetings and parties. The upstairs is indeed locked, simply because it has not been remodeled as the lower floor has been. A funny fact is that a CPR Dummy has been propped up on a chair in front of a window on the second floor. Twisted humor I suppose. At any rate, you cannot rent the house I believe without a rather substantial insurance policy, thus the Mill will not incur the expense of damage or injury of any particular function. However the Mill does use it, such as for parties, like the Family Day it hosted last month for its employees. The House has security patrols nightly, wherein the security personnel physically enter the house several times throughout the entire night, every night. If an eye witness accounting is desired, all one would have to do is wait outside the gate for any of these officers to come by to check the house and I am sure any of them too would affirm that there is nothing spooky going on inside. Will they let you in to see it first hand? No. There is a liability issue for the Mill, thus this would not be allowed. First, let me start by saying if you do not believe in the supernatural they will not be open to you or showing themselves to someone who is going to dismiss their existence. These spirits aren't ghosts. I know. I took photos for research and when I left something came with me. A shadow person perhaps. It was in my apartment as I was writing this book. My cat, my dog and myself all saw this shape of a large person pass across all of my walls and into the spare room. I tried to debunk it. I TRIED! there was absolutely no logical or rational explanation. I came home from work several times to all of my cabinets open and lights on. Now, I know what everyone is thinking. It was not my exaggeration. I called the police after arriving to all of my doors were left open. I dead bolted them, still I pressed on. I know what the spirits were doing but you see I wasn't writing it for me. I was doing it for my dying mother. I promised I would tell her story and get my book published. Unfortunately it was not until after she died that I was successful with my promise. You went in the house, GREAT. You experienced nothing, understandable. But will we ever believe that house is normal? NO I will never and I am positive there are thousands of others who would agree with me. Perhaps when you are more open with the possibility of the paranormal presence being a possibility, they will show themselves to you as well. Until then, you will not see, hear or speak with any of the spirits that I think and believe are present at the house with no address. built in 1910 as the sign says but there are records showing that too is a lie. I have my story. I shared it and I hope everyone enjoys the way I put all the interviews together. Some things will never be public. Not even the truth about why they still rent it for weddings etc. But deny me when I told them money wasn't an option. 15 or so years ago, I was involved in a fund raising event at the Martin House on a Saturday - Halloween Day! I did see two ghosts drive up in and old black car that afternoon as I was decorating the living room for the party that night. There really are at least two ghosts associated with that property. I saw them for myself in the middle of the afternoon. uhh....Larry Gordon... There is no "living room" in the Martin House. Just a Kitchen, two bathrooms, a few storage closets and one huge conference or ball room. Has been that way for over 30 years. You sure you were in the Martin House? And, ghosts drive cars now too? What's the address to this house? JUST STUMBLED ACROSS THIS WEBSITE AND I HAVE TO AGREE WITH ANYONE WHO SAYS THIS PLACE IS HAUNTED.ABOUT 15 YEARS AGO SOME FRIENDS AND I WENT THERE JUST TO CHECK IT OUT. AT ONE POINT I LOOKED UP INTO ONE OF THE WINDOWS ON THE SECOND FLOOR AND SAW MY BABY SISTER STANDING THERE. SHE DIED 2 DAYS BEFORE HER 7TH BDAY AND WE BURIED HER 2 DAYS AFTER. SHE DIED IN 1988 THERE WAS NO REASON FOR HER TO B STANDING THERE. THEY SAY DEMONS WILL USE WHATEVER THEY CAN TO DRAW YOU IN EXPLAIN THAT YOU CLOSED MINDED IDIOTS. TO MYTH BUSTER YES THE MARTIN HOUSE HAS A LIVING ROOM. I HAVE BEEN THERE ON MORE THAN ONE OCCASION. THE UPSTAIRS HAS A LOGGING CHAIN ON IT BIG ENOUGH TO HOLD FLUFFY FROM HARRY POTTER. YOU KNOW THE GIANT THREE HEADED DOG. MAYBE YOU NEED TO TAKE A VISIT TO THE HOUSE, BECAUSE YOU HAVE MOST LIKELY NEVER STEPPED FOOT ON THE PROPERTY. FOR THOSE OF US WHO HAVE WE KNOW THE TRUTH NO MATTER WHAT YOU CLOSED MINDED MOUTH SAYS. AND BY THE WAY LEAVE THE AUTHOR ALONE. SHE WAS THERE NOT YOU. Ok, here is what happen around June 1988, I was with 2 friends that were driving around trying to find something to do. It was a hot summer, when one of us had the idea to go to the Martin House to see what the real deal was. Well we jumped the fence, ran as fast as we could to the house. When we reached the house all the doors were locked. But, as we walked around the house, thinking everything was OK!!!! !, OMG we saw someone coming form the house at us chasing us towards the lake. Now I'm not saying it was a real person, I'm saying we ran down towards the lake and then as we looked back it was gone. Now, I know what you are thinking, we were on drugs or drunk, well it was the 80's and yes we were drinking, but when 3 people see the same thing at the same time, well you do your owe assumption. I'm only giving you the account of what I saw at the time. Now on that same note, do you know how the Martin Lake was formed? Look into that, because I have read somewhere that the lake was dug by the hands of slaves, I do not have proof of this!! At one time my mother worked for a company that owed the property before the Paper Mill owed it. In some of the old documents that were hand written and not typed, there were several notations of slaves digging a large portion of the lake. I can not verify this, but if you ask me YES the place is HAUNTED!!!!! I've seen it for myself!! IVE ACTUALLY SEEN THINGS IN THE NIGHT THERE AND IT WAS ON HALLOWEEN.THEN MY SISTER WROTE THE BOOK.I THINK SHE DID AN AMAZING JOB WRITING THIS BOOK IN WHICH I HAVE READ. 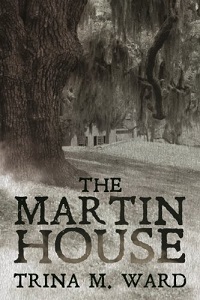 I LOVE THE SUSPENSE AND THE TWISTS IN THE STORY.THIS PLACE THE MARTIN HOUSE IS SPOOKY JUST LOOKING UPON WHERE ITS BUILT. The comment above about the lights flickering and the curtains being pulled back is very very true. I currently work for the mill and have always heard the stories of the martin house being haunted. We have functions there every so often and I plan on attending next chance I get. It will be very interesting to finally see what the place looks like on the inside! That wasn't mythbuster, that was me. The house was built by John C Gray. He built many houses in the area. The Martin family referenced in the video died elsewhere of natural causes. I believe there may be some information about the house at the Bay County Library. I will, however, agree with the Channel 13 news story that nothing is going on there. Have been there recently and saw nothing because nothing is there but an occasional rat or cockroach. Bravo... Finally someone else stands up against to the people who don't see what the spirits don't want them to see because they are pessimists. I too am a sensitive in certain ways and also the author of the book. There is something that lingers there. I don't think it wants to leave that house or property... Thank you for your comments and sharing your experiences.